Writing errors make you look bad. We’re here to help. We’ve seen a lot of grammar problems, clichés, awkward usage and just plain awful writing tics in our time, and so we’re on a mission: We’d like to cleanse the Internet of all its amateurish writing. 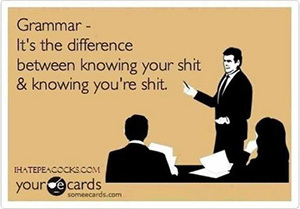 But writing about grammar and usage is precarious. What if we get something wrong? What if we use a cliché while slamming cliché usage? We’re on thin ice. What if we start a paragraph with “but?” We’ll take that risk with a boatload of tips that is by no means complete or exhaustive. Its/it’s: Memorize this, study it, do something, because some readers think this error is so abhorrent, they will stop reading the instant they see you misuse it. Over at: “The writers over at Boing Boing found an entertaining video.” Unnecessary words. It’s electronic, they’re not “over at” anything or anywhere. And you only need one directional, not two of them up in here. “Reach out:” Strangely enough, this cliché phrase began its touchy-feely life in a television commercial for AT&T. “Reach out and touch someone.” That was the slogan. Now it’s grown into an all-consuming monster. It’s dragged out every time we want to say we contacted someone. I think it’s important to be specific about how you contacted someone. Say emailed, or called, or talked with someone. How did you “reach out?” Was the guy drowning and you reached out to pull him onto the dock? Even if you have to say “contacted someone,” it’s better than “reaching out.” You’re not reaching out to anything, this is all electronic. No reaching. Clichés: grails, antes, touch base, loop in, nest egg. The first time someone used these, it was probably clever. Now it’s tired business speak. No grails, don’t raise any more antes. Towards: It’s toward. It’s forward. Not towards, not forwards (unless you’re writing in British English). The word “that” can often be omitted — e.g. “There’s not much that its code-free apps can’t do.” We use the word “that” in sentences so often, that it’s something that I think that we might want to stop. Stop that. Try dropping the word “that,” and you’ll notice that your sentences are tighter. I mean, you’ll notice your sentences are tighter. “Should” instead of “if” — “Should you find yourself without water or power…” I’m not sure where this one came from, but it’s popping up too often. Awesome: This used to be a wonderful word. Now, it’s been overused and it’s lost all its power. I would suggest using it only in its proper context, such as times when you’re referring to explosions, hurricanes, things that are gigantic, unbelievable, one-of-a-kind and rare. “Amazing” is elbowing in to take the place of “awesome.” Use it sparingly. An ellipsis needs an extra dot (with a total of four) if it’s the end of a sentence…. And be careful with the ellipses overall — they’re on the verge of overuse. Impact as a verb: “How has Google impacted your life?” Although some grammar mavens will disagree with me on this one, “Impact” is not a verb unless you’re talking about an asteroid impacting the earth, or a wisdom tooth being impacted. You could have an impact on something, but you can’t impact it. Very: Write very, very, very powerfully and you won’t need to lean on this crutch. “We want to hear your thoughts.” I’ve never heard a thought before. I would rather use the word “opinion” for thought, anyway. Or perhaps ask, “let us know what you think.” Thoughts? Don’t ask for them. No one is going to write down thoughts. They’re thinking them, not writing them. Premiere vs. premier: I messed this one up on a TV graphic once, and that’s how I learned it. A premiere is an event when something new is presented. Premier is something at the top of its class, the best, or a person who is in charge of a government. Adobe Premiere is a software application. It is the premier video editing application. Loose and Lose: You know the difference, right? Oh, what a difference one letter makes. Heads, you win; tails, I lose. I don’t loose. Passed away, passed: “Passed away” softens death and sounds folksy. Funeral directors say it a lot. But it doesn’t sound professional for writers. People die. Deal with it. They are dead. Someone has died. “Passed away” has religious connotations, and it’s amateurish. “Passed” is even worse, sounding like something your great-grandmother would have said. I don’t even like to use the term “RIP,” which also has religious connotations and is archaic, but it’s good for SEO. People that, those that — people who, those who. People are referred to as “who,” not “that.” People are humans, not things. Throat clearing: When emailing or writing anything, you only have about a dozen words to grab a reader’s attention. Use them wisely. Get to the point in the first paragraph, as quickly as possible. People are busy, and you can’t squander your only chance to lure them in. In order to: There’s rarely a case when you need to use this phrase. Just leave out the words “in order” and just say “to.” In order to make the most of your writing, stop using the inefficient and flabby phrase, “in order to.” It’s similar to that other hitchhiker of a word, “that.” Try getting rid of “in order to” and “that,” and notice how much tighter your sentence sounds. Whenever you talk about a couple of things, don’t forget the word “couple” has a trusty companion, the word “of.” Sure, people like to talk about having a couple beers, things that happened a couple months ago, giving a couple examples — but I think it’s a bit too folksy for pro writing. New words: These two relatively new words haven’t gotten their usage nailed down yet: ereader and checkin. Make those electronic books easier to read about by referring to them as e-readers. And please, make your favorite thing to do on Foursquare sound like something beyond a description of barnyard animals, and call it a check-in. Junkies: The era of calling people “junkies” if they like to do something is over. If you’ve ever seen, known, or heard about what junkies are really like, you won’t want to call someone that, or refer to yourself as such, either. Better to use the words aficionado, fan, lover, or even fanatic if you must, but junkies are sad and ill and need our help. Wide variety: A variety is already wide enough without adding the word wide. Ask yourself whether there is such a thing as a narrow variety. Tweeted out: It’s stylish to talk about “tweeting out” and “sharing out” things, but is the word “out” really necessary in this context? Is it possible to “tweet in” something? Retina: Apple’s high-resolution displays are Retina displays, not Retina Displays or retina displays. Dollars dollars: When you have a dollar sign next to a word, you don’t need to have the word dollar written after it: “$13 billion dollars” is incorrect. All you need is $13 billion. And love. Love is all you need. Teen slang: While we’re on the subject of the word “like,” a word we hippies were so fond of using in the ’60s and which has grown to the teen-slang monster it is today: like, stop, like, using it in that context. You know? How many? “A number of” or “numerous” tells you nothing. What’s that number? Is it a secret? Just write “several,” or “a few” for rough estimates — or better yet, get the actual number. Begs the question: Writers get this wrong almost every time it’s used. The phrase “begs the question” seems to say that it practically begs for a question to be asked. But the term “begs the question” actually means using an unproved point to prove itself. For example, “You shouldn’t beg the question because begging the question is something you shouldn’t do.” That’s begging the question. Borrow: “Can you borrow me a dollar?” I think this is a Midwestern thing, something I was surprised to hear someone say. But I put it in here for laughs and to make you feel superior for not saying it. But: Starting a sentence or paragraph with “but” is not a good idea, in the opinion of some grammar sticklers. But I think it’s okay, and this is my opinion piece, it says right there at the top of the page. So that’s my opinion. But I could be wrong. Will make you drool: This was a popular phrase with which to express affection for a particular gadget, a usage that arrived shortly after the “throw up a little in my mouth” era. However, describing your lust for consumer electronics using any kind of bodily secretion is a bit over the top. Only time will tell: Charlie once worked at a TV station where the news director said he would fire anyone who used the term “only time will tell” at the end of a story. Somehow, that’s never left him, and maybe the guy had a point. The news staff had just gone through four newscasts in a row where reporters ended their stories with those words. The phrase was never spoken again within those walls. Will Charlie actually use this phrase again? Only time will tell. We mean, no, he won’t.